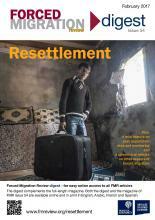 This issue of FMR looks at some of the modalities and challenges of resettlement in order to shed light on debates such as how – and how well – resettlement is managed, whether it is a good use of the funds and energy it uses, and whether it is a good solution for refugees. It contains 33 articles on Resettlement, plus a mini-feature on Post-deportation risks and monitoring and four articles on other forced migration topics. Also available is the FMR 54 digest for easy online access to all the articles published in FMR 54. It provides for each article: the title, the author(s) and their affiliation, the introductory sentences and links to the full article online. The digest will be available online and in print in all four languages. If you would like printed copies of either the magazine or the digest, please email us at fmr@qeh.ox.ac.uk. 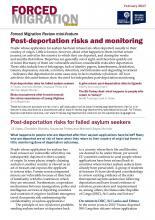 The mini-feature on Post-deportation risks and monitoring is available as a stand-alone 12-page pdf (see link in ‘Reading and download options’ above) but is not available in print; please feel free to print it yourself. If printing out the magazine, digest or mini-feature, please note that they are all published in A5 format (half of A4). In order to print them out properly, please use your printer’s ‘Booklet’ setting. Please help disseminate this issue as widely as possible by circulating to networks, posting links, mentioning it on Twitter and Facebook and adding it to resources lists. We encourage you to circulate or reproduce any articles in their entirety but please cite: Forced Migration Review issue 54 www.fmreview.org/resettlement. We would like to thank Immigration, Refugees and Citizenship Canada, RefugePoint, the Government of the Principality of Liechtenstein, the Swiss Federal Department of Foreign Affairs and UNHCR’s Division of International Protection for their financial support of this issue. The 15-year-old Syrian boy pictured on the cover of this issue is hoping to be resettled in Canada and he and his family are in the final stages of assessment. They live in a two-room shelter in an informal refugee settlement in Lebanon. He keeps his suitcase packed. Could FMR support your funding bid? FMR has on occasion been included in successful programmatic and research funding bids, to the mutual benefit of all parties. If your organisation is applying (or is part of a consortium applying) for external funding, would you consider including FMR in your proposal narrative and budget, to support the dissemination of learning and results on your particular subject matter? We would welcome the opportunity to discuss this. Please contact the Editors at fmr@qeh.ox.ac.uk.